The honeyeaters are a large and diverse family of small to medium sized birds most common in Australia and New Guinea, but also found in New Zealand, the Pacific islands as far east as Hawaii, and the islands to the north and west of New Guinea known as Wallacea. Bali, on the other side of the Wallace Line, has a single species. 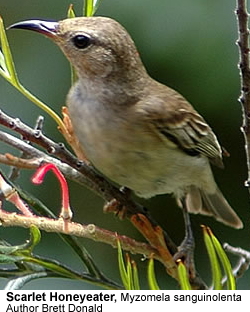 Honeyeaters and the closely related Australian chats make up the family Meliphagidae. In total there are 182 species in 42 genera, roughly half of them native to Australia, many of the remainder occupying New Guinea. Like their closest relatives, the Maluridae (Australian wrens), Pardalotidae (pardalotes and thornbills), and Petroicidae (Australian robins), they originated as part of the great corvid radiation in Australia-New Guinea (which were joined in a single landmass until quite recent geological times). 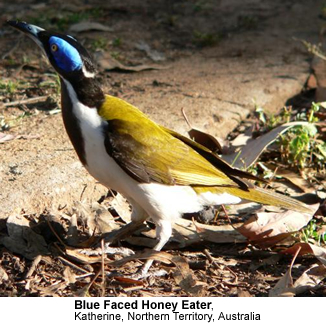 Although honeyeaters look and behave very much like other nectar-feeding passerines around the world (such as the sunbirds and flowerpeckers), they are unrelated, and the similarities are the consequence of convergent evolution. Unlike the hummingbirds of America, honeyeaters do not have extensive adaptations for hovering flight, though smaller members of the family do hover hummingbird-style to collect nectar from time to time. In general, honeyeaters prefer to flit quickly from perch to perch in the outer foliage, stretching up or sideways or hanging upside down at need. All genera have a highly developed brush-tipped tongue, longer in some species than others, frayed and fringed with bristles which soak up liquids readily. 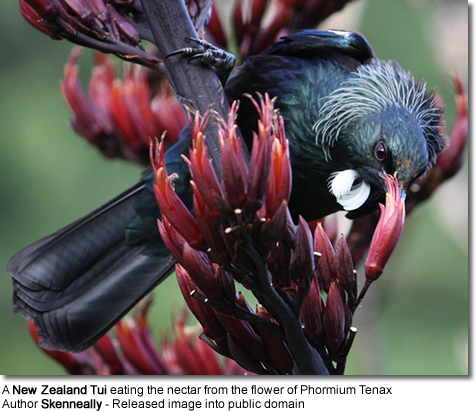 The tongue is flicked rapidly and repeatedly into a flower, the upper beak then compressing any liquid out when the bill is closed. 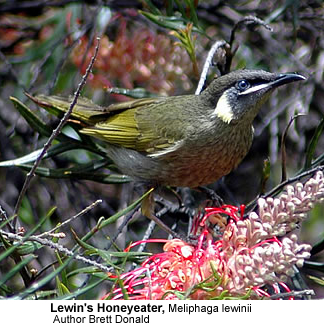 The extent of the evolutionary partnership between honeyeaters and Australasian flowering plants is unknown, but probably substantial. A great many Australian plants are fertilised by honeyeaters . It is known that the honeyeaters are important in New Zealand as well, and assumed that the same applies in other areas. In addition to nectar, all or nearly all honeyeaters take insects and other small creatures, usually by hawking, sometimes by gleaning. A few of the larger species, notably the White-eared Honeyeater, and the Strong-billed Honeyeater of Tasmania, probe under bark for insects and other morsels. Many species supplement their diets with a little fruit, and a small number eat considerable amounts of fruit, particularly in tropical rainforests and, oddly, in semi-arid scrubland. The Painted Honeyeater is a mistletoe specialist. Most, however, exist on a diet of nectar supplemented by varing quantities of insects. 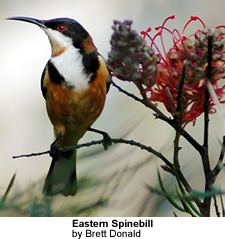 In general, the honeyeaters with long, fine bills are more nectarivous, the shorter-billed species less so, but even specialised nectar eaters like the spinebills take extra insects to add protein to their diet when they are breeding. A new species of honeyeater, not yet described but previously called "Smoky Honeyeater", has been discovered in December 2005 in the Foja Mountains of Papua, Indonesia. Black-eared Miner, Manorina melanotis The Black-eared Mine is a critically endangered honeyeater endemic to mallee woodland in south-eastern Australia. It is closely related to the much more widely distributed Yellow-throated Miner M. flavigula and the taxonomic status of the Black-eared Miner is the subject of some controversy, with some researchers considering it a subspecies of M. flavigula. Black-eared Miners are co-operative breeders, living in colonies during the breeding season, and dispersing into the bush during non-breeding periods. Little is known of their movements during these periods. Lewin's Honeyeater, Meliphaga lewinii : Lewin's Honeyeater Meliphaga lewinii inhabits the ranges along the east coast of Australia. It has a semicircular ear patch, pale yellow in colour. The name of this bird commemorates the Australian artist John Lewin. Scarlet Honeyeater, Myzomela sanguinolenta : The Scarlet Honeyeater inhabits the east coast of Australia. The male is red with black wings; the female is entirely brown.